Soldiers learn pitfalls of bomb training – Fort Hood Herald: Across The Fort. 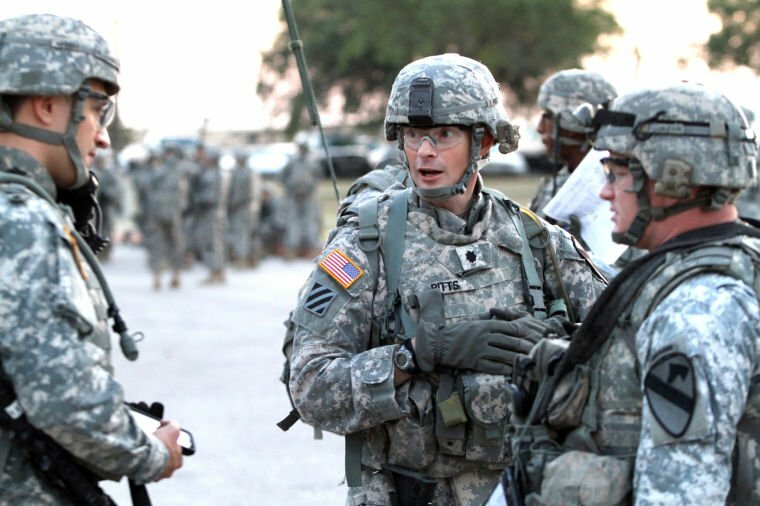 Lt. Col. Esli Pitts, commander of the 3rd Battalion, 8th Cavalry Regiment, 3rd Brigade Combat Team, 1st Cavalry Division, talks to soldiers of the battalion as they conduct a training exercise Wednesday, July 3, near battalion headquarters at Fort Hood. While other units were jogging down Battalion Avenue in formation and singing cadences during morning physical training, “Warhorse” soldiers were in full battle gear as they prepared for confrontation with an opposing force. Soldiers were tracking a potential bomb-making facility, and had to maneuver through enemy forces, while providing wide-area security, to find the facility and disarm the threat. The idea behind the July 3 training scenario of 3rd Battalion, 8th Cavalry Regiment, 3rd Brigade Combat Team, 1st Cavalry Division, was to provide all the components of a full-scale operation with a physical training element thrown in, said Lt. Col. Esli T. Pitts, battalion commander. “I’ve always found that you can do a lot of tactical training during PT. It’s a couple hours in the morning when everybody is dedicated to PT anyway, so it’s easy to just do tactical operations with PT,” he said. Last week’s training incorporated the entire Warhorse battalion, as well explosive ordnance disposal soldiers from the 79th Ordnance Battalion and human intelligence collection teams. “The entire battalion is out and it doesn’t get any better than that,” Pitts said. We’ve talked before about the anti-IED project in Iraq and Afghanistan known as Task Force ODIN. Via War News Updates, here’s an further look at how the military is trying to defeat the IED threat. Since the wars in Afghanistan and Iraq began, roughly half of all our casualties have been caused by IEDs, and the military has recognized that this is a threat that we well be facing long into the future. It has spent enormous sums of money trying to find technical means of detecting and defeating IEDs. High tech is something the US is good at, so we tend to like to take a high tech approach to most problems. That’s much of what the Joint Improvised Explosive Device Defeat Organization has been trying to do. But the problem with that is that IEDs are almost by definition somewhat low tech. And that means that the most effective counter is going to be somewhat low tech as well. The human eyeball is still the most dangerous sensor on the battlefield. Of the 909 NATO military personnel killed in 2009 and this year, 540 died from IED attacks, according to the monitoring group icasualties.org. Mr. Hunter became so frustrated by the lack of the task force’s counter-IED assets in Afghanistan that he wrote to Gen. Petraeus as he took command in July. Iraq and Afghanistan are different theaters, and what works in one won’t always work in another. But there is simply no excuse to not even attempt to duplicate success. Update: Welcome, Conservative Grapevine readers. I hope you will look around. If you have a question, just ask. My goal here is to help you understand how the Army works. You’ve seen on the news how Iranian made EFPs are being used as roadside bombs to attack US vehicles in Iraq. But what is an EFP? Early IEDs in the Iraq War were mostly artillery shells wired to explode. The first Humvees in Iraq had thin armor that would not protect very well against nearby explosions. As up-armored Humvees became available, these early IEDs lost some of their effectiveness. The insurgents reacted in two ways. First, they used bigger IEDs, wiring together several artillery shells at once. The larger blast was more effective, but took longer to emplace and were easier to spot. The second technique, using EFPs, is more difficult to counter. EFP stands for Explosively Formed Penetrator. Using the concept behind a shaped charge, a disc of metal on one end of a charge can be blasted in the direction of the target. The charge is usually a steel pipe, 6-8″ in diameter. When detonated, the concave disc is deformed by the explosion, and reformed into a slug. The explosion pushes this slug at phenomenal speeds- up to Mach 6. One of the biggest advantages of EFPs is standoff. The damage to the target isn’t caused by the explosion, but rather by the slug it fires. This means that the EFP doesn’t need to be right next to the roadside to be effective. This means that US soldiers have to scan a much larger area to detect IEDs. An EFP can usually penetrate as much armor as the diameter of the charge. That is, a charge 6″ in diameter should be able to penetrate 6″ of armor, more than enough to defeat the armor of any Humvee, and indeed, all but the most heavily armored tanks. Clearly, the threat posed by EFPs is one of the reasons that the US is putting so much pressure on Iran to stop equipping insurgents. Other countermeasures have included focusing on raiding bombmakers. Because the EFP fires a single slug, timing the explosion is critical. Too soon, the slug goes in front of the vehicle. Too late and it misses behind. To get around this, the insurgents are using a cheap passive infrared sensor, sorta like an electric eye. When a Humvee passes in front of the sensor, off goes the EFP and destroys the vehicle. Ahh, but it didn’t take long for the US to come up with a countermeasure. You can see in the photo below a “Rino” device, designed to trigger the EFP before the Humvee reaches the kill-zone. Normally, it would be lowered so it is in front of the Humvee. An unsuccessful EFP attack can be seen here. Author XBradTC2Posted on July 2, 2008 Categories armor, ARMY TRAINING, iraqTags EFP, Humvee, IED, Iran, iraq13 Comments on What’s an EFP?